Anybody who’s eaten a McDonald’s hamburger in Springfield has feasted on a bit of local Lithuanian-American history involving a family aptly named “Mack” (Lith: Makarauskas). McDonald’s first local franchisee, John Mack, Sr., was born in Lithuania in 1912 of parents Stanley and Agnes Makarauskas. 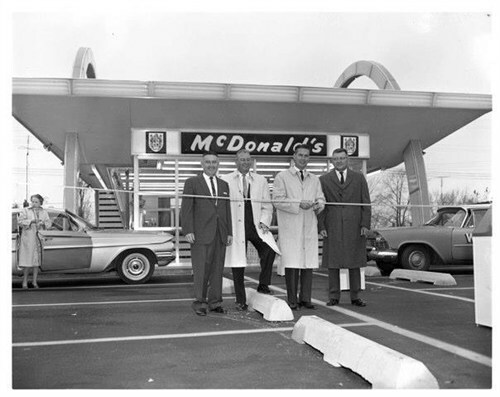 He was a coal miner before operating Mack’s Food Store at 1501 Keys Ave.
At the peak of their McDonald’s empire, the Macks were exclusive franchisees of 8 McDonald’s all over Springfield, including the Old Capitol Plaza and White Oaks Mall, according to the State Journal-Register. (There was an additional McDonald’s in Jacksonville.) It is said that John Mack, Sr. was the first politically active Lithuanian-American in Springfield. His son Tom recalls that John, Sr. was a member—perhaps a leader– of the Progressive Miners of America (see The Mining Life and The Mine Wars pages on this site). Over and above that, John, Sr. was famous for providing groceries on credit to under-employed and striking miners–most likely from a home-based “commissary” during the Mine Wars and later from his corner grocery. Back in the 1920s, coal miners opening corner stores seemed to be a trend. Former miner Paul Kasawich opened a grocery/tavern next to his home on East Reynolds. My own Hungarian immigrant grandfather, Joseph Kohlrus, was a coal miner before he opened Kohlrus Foods on Converse at the RR tracks, not far from Mack’s Food Store on Keys. It must have looked like a good way to give the family a solid alternative to dangerous, sporadic—and disappearing—work in our local mines. 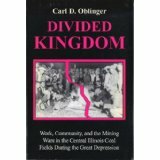 The violent “Mine Wars” that accompanied mechanization and massive layoffs, locally, by Peabody Coal (1932-36) that are detailed in Oblinger’s book sadly proved these miners-turned-grocers correct. In 1988, the couple’s son Tom Mack went on to become the founding and long-time president of the Lithuanian-American Club in Springfield. Son and Lexington, Ky-area businessman John Mack Jr., 70, died in 2008. He and his ex-wife Beverly had three daughters: Leslie Preuss of Florida, Carole Mack-Joefreda of Lexington, Ky., and Marilyn Mack of Virginia; and a son, John Mack, III, of Nicholasville; Ky, who carries on a proud family name. For more information, see “Here’s the Beef / How Springfield Got its First Fast Food,” by Dave Bakke in the April 27, 1999 State Journal-Register. Many thanks to Elaine Alane, Bill Cellini, Jr. and Hannah, one of John, Sr.’s great-granddaughters, for assisting with this post. Joann Mack was my best friend in Highschool. Joann and I went to Ursuline Academy. She married Bill Shaugnessy. Reading the article brought back any memories, The Mack’s were a great family. I had no idea that Lithuanian-Americans owned those McDonalds! Thanks for the great story! Very interesting. I did not know about the 1st McDonald’s franchises. I am also interested in the coal mine wars. A quick visit to the Mother Jones monument in the National Miner ‘s Cemetery In Mt Olive is also very interesting. classmates and friends. Sandy, you did an outstanding job!!!! Congratulations on this achievement!!! GREAT!!!! Thanks for this story about my maternal grandparents. I would like to add their eldest daughter to the story – my mother, JoAnn “Mack” Shaughnessy, who died in 2007, and along with her husband, William Shaughnessy (d. 1995), had 7 children: Pamela Shaughnessy Becker, Debra Shaughnessy Blazis, Timothy Shaughnessy, Michael Shaughnessy, Patrick Shaughnessy, Terrence Shaughnessy, and myself: Colleen Shaughnessy.